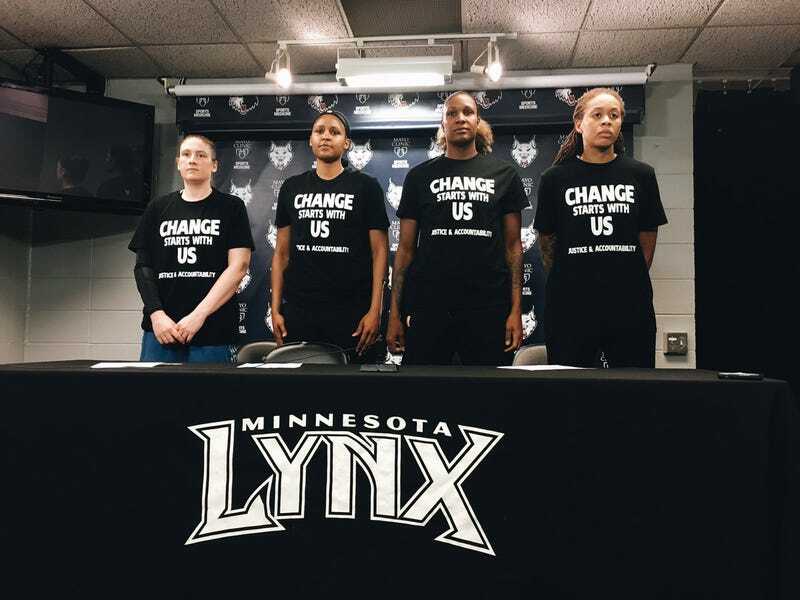 Captains of the WNBA’s Minnesota Lynx show the front of their warm-up shirts, demanding accountability regarding recent fatal shootings by and against police. The WNBA has reversed its decision to fine the teams and players who wore black protest warm-up shirts saying “Alton Sterling,” ”Philando Castile,” “Black Lives Matter” and “Dallas 5,” ESPN reports. WNBA President Lisa Borders said in a statement Saturday that the league was rescinding the $5,000 penalties given to the Indiana Fever, New York Liberty and Phoenix Mercury, as well as the $500 penalties levied against their players for wearing the shirts after police killed two black men on video: Alton Sterling in Baton Rouge, La., and and Philando Castile in Falcon Heights, Minn. Some police officers covering the games walked off the job because of the shirts. Players spoke out against the fines in postgame interviews and on social media, notes ESPN. Carmelo Anthony of the New York Knicks also voiced his displeasure with the fines. Borders also tweeted her support for the players.